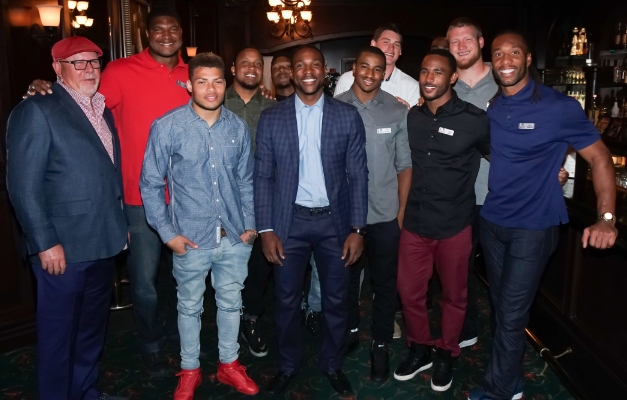 Arizona Cardinals’ All-Pro cornerback Patrick Peterson welcomed almost 200 guests to Donovan’s Steak and Chop House on Monday, November 16, 2015 for his second annual Celebs and Steaks event, raising more than $250,000 to benefit his Foundation for Success. The foundation aims to provide low-income and inner city youth with opportunities and resources to reach their full potential. Proceeds from the evening will help fund community outreach programs, such as Patrick’s Corner in an effort to fulfill the mission of the Foundation for Success. For one evening only, several Arizona Cardinals, including Coach Bruce Arians, Justin Bethel, Deone Bucannon, Calais Campbell, Larry Fitzgerald, Tony Jefferson, Rashad Johnson, Tyrann Mathieu, Josh Mauro, Troy Niklas and Alex Okafor joined Peterson to trade in their uniforms and helmets for aprons and trays to benefit Peterson’s cause. In addition to celebrity service from Peterson and the Cardinals, guests enjoyed a cocktail reception sponsored by Hensley Beverage Company and four courses of world-class cuisine, accompanied by the finest of wine. Jody Oehler, Fox Sports 910 Phoenix Sports Talk Host, served as the evening’s emcee, while Brian Baumhor of Pacific Coast Auctioneer served as the evening’s auctioneer during exciting live and silent auctions.